The following page shows the career & education requirements, salary and job outlook for a Nurse Practitioner around the country. Nurse practitioners have the ability to practice independently in 26 states. For some NPs, they have similar duties as regular registered nurses, including collecting information about the condition of the patient and taking action to treat and manage his health. A nurse practitioner also can conduct specialized research and teach staff about new treatments and procedures. Most NPs work in medical offices, managed care organizations and hospitals. They also often deliver care in rural areas and urban health centers and at some employee health centers. About 15% of all NPs have their own private practices. An NP’s work is often physically and emotionally difficult, and many NPs spend the day on their feet. This work can be stressful just like a doctor’s job because they have to make critical decisions quickly about a patient’s health. NPs also have to work in close proximity with highly infectious diseases, so they have to follow careful guidelines to ensure that they do not become sick themselves. A nurse practitioner has to earn a master’s degree in nursing. This advanced degree takes approximately three years to earn and includes extensive classroom and clinical work. You will take difficult courses in anatomy, physiology, pharmacology and chemistry to get your master’s degree. You also have to be a registered nurse (RN) with extensive work experience before you become a nurse practitioner. It helps if you have a bachelor’s degree in nursing, but some master’s programs allow you to earn a Bachelor’s and Master’s degree at the same time. These are called bridge programs. After you graduate from your master’s program, you must pass a national certification exam. After you become a general nurse practitioner, you can later earn many different certifications so that you can work in specialty areas that you prefer, such as oncology, pediatrics, acute care, cardiology, mental health, and geriatrics. See a comparison of the different types of nursing degrees. After you earn your master’s degree, you must pass your national certification examination to become an NP. You must also have an active RN license. There are many specialties that you can focus your career on as an NP. Each one has different certifications that you can earn so that you are qualified to work in that specialized NP field. The NP field also has many different certification exams for the different specialties. Certifications can be obtained through many prestigious national organizations, such as the American Nurses Credentialing Center and the Pediatric Nursing Certification Board. Easily earn a Masters in Nursing MSN degree from the following accredited schools online and on your time. Click request information to learn about tuition and financial aid, courses & curriculum, admissions and starting dates. According to Indeed.com, the following career/job titles with salary figures are most closely related to Nurse Practitioner. The Bureau of Labor Statistics (BLS) reports that the median salary for NPs is $98,190. Generally, the best-paying jobs are found in state, local and private hospitals, with doctors’ offices also well paid. Employment of nurse practitioners is going to increase by 31% by 2024, which is much faster than average. Many healthcare providers are focused on reducing costs, and one of the major ways to do this is to have NPs and physician’s assistants do many of the same jobs as doctors. This trend is going to greatly increase job possibilities for NPs in the long run. The demand for NP services is also being driven by the wider availability of health insurance, and also because elderly people are living longer and want to have more healthy and fulfilling lives. This drives demand for many health care profession fields, which means that job demand will continue to increase, as will salaries. There is so much work available in this field that it is possible to work a full time job as an NP and also work part time in another job. According to Indeed.com, the average national salary of jobs for Nurse Practitioner was $95,000 with a high confidence ranking based on over 250 sources. Average Nurse Practitioner salaries for job postings nationwide are 66% higher than average salaries for all job postings nationwide. The following lists Nurse Practitioner salaries in each state around the country. The figures are based on the total number of job postings by employers through Indeed.com. For example, DC had the largest quoted salary of $120,000 while Hawaii had the smallest quoted salary of $59,000. Average Nurse Practitioner salaries for job postings in Alaska are 26% lower than average Nurse Practitioner salaries for job postings nationwide. The average salary ranks 48th among states in the country. There were also job openings from employers like Southcentral Foundation, Aureus Medical Group, Providence Health & Services, and Yukon-Kuskokwim Health Corporation. Average Nurse Practitioner salaries for job postings in Alabama are 1% higher than average Nurse Practitioner salaries for job postings nationwide. The average salary ranks 13th among states in the country. There were also job openings from employers like UAB Medicine, MedOptions, Curo Health Services, and Supplemental Health Care. Average Nurse Practitioner salaries for job postings in Arkansas are 2% higher than average Nurse Practitioner salaries for job postings nationwide. The average salary ranks 12th among states in the country. There were also job openings from employers like Correct Care Solutions, Mercy, Catholic Health Initiatives, and MedExpress. Average Nurse Practitioner salaries for job postings in Arizona are 18% lower than average Nurse Practitioner salaries for job postings nationwide. The average salary ranks 43rd among states in the country. There were also job openings from employers like MY DR NOW, Good Health Companies, Banner Health, and Northeast Healthcare Recruitment. Average Nurse Practitioner salaries for job postings in California are 7% higher than average Nurse Practitioner salaries for job postings nationwide. The average salary ranks 7th among states in the country. There were also job openings from employers like Kaiser Permanente, Saratoga Medical, Integrity Locums, and Stanford Health Care. Average Nurse Practitioner salaries for job postings in Colorado are 11% lower than average Nurse Practitioner salaries for job postings nationwide. The average salary ranks 33rd among states in the country. There were also job openings from employers like Correct Care Solutions, Integrity Locums, University of Colorado, and FCSpsy. 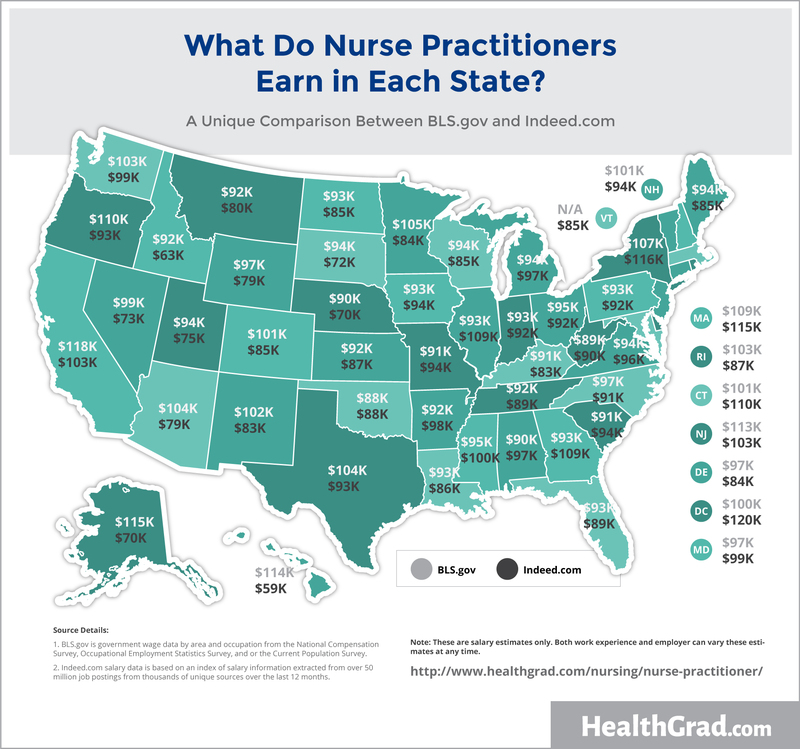 Average Nurse Practitioner salaries for job postings in Connecticut are 15% higher than average Nurse Practitioner salaries for job postings nationwide. The average salary ranks 4th among states in the country. There were also job openings from employers like Yale New Haven Hospital, Execu | Search, Northeast Healthcare Recruitment, and CVS Health. Average Nurse Practitioner salaries for job postings in Washington, DC are 25% higher than average Nurse Practitioner salaries for job postings nationwide. The average salary ranks 1st among states in the country. There were also job openings from employers like Medstar Georgetown University Hospital, Dimensions Healthcare System, CVS Health, and Wexford Health Sources, Inc..
Average Nurse Practitioner salaries for job postings in Delaware are 12% lower than average Nurse Practitioner salaries for job postings nationwide. The average salary ranks 38th among states in the country. There were also job openings from employers like Nemours, Christiana Care, Beebe Healthcare, and Interim HealthCare. Average Nurse Practitioner salaries for job postings in Florida are 7% lower than average Nurse Practitioner salaries for job postings nationwide. The average salary ranks 27th among states in the country. There were also job openings from employers like Opis Senior Services Group, Nemours, Terradin LLC, and Largo Medical Center- Largo. Average Nurse Practitioner salaries for job postings in Georgia are 14% higher than average Nurse Practitioner salaries for job postings nationwide. The average salary ranks 5th among states in the country. There were also job openings from employers like Northside Hospital, Northeast Georgia Health System, Kaiser Permanente, and Emory Healthcare. Average Nurse Practitioner salaries for job postings in Hawaii are 38% lower than average Nurse Practitioner salaries for job postings nationwide. The average salary ranks 51st among states in the country. There were also job openings from employers like Kaiser Permanente, CVS Health, HMSA, and Opportunity Healthcare. Average Nurse Practitioner salaries for job postings in Iowa are 2% lower than average Nurse Practitioner salaries for job postings nationwide. The average salary ranks 16th among states in the country. There were also job openings from employers like PPRRiskAdjust.com, UnityPoint Health, The University of Iowa, and FCS. Average Nurse Practitioner salaries for job postings in Idaho are 34% lower than average Nurse Practitioner salaries for job postings nationwide. The average salary ranks 50th among states in the country. There were also job openings from employers like St. Luke’s Health System, Opportunity Healthcare, Kootenai Health, and Pathways of Idaho. Average Nurse Practitioner salaries for job postings in Illinois are 13% higher than average Nurse Practitioner salaries for job postings nationwide. The average salary ranks 6th among states in the country. There were also job openings from employers like Wexford Health Sources, Inc., OSF Healthcare, JourneyCare, and CVS Health. Average Nurse Practitioner salaries for job postings in Indiana are 4% lower than average Nurse Practitioner salaries for job postings nationwide. The average salary ranks 22nd among states in the country. There were also job openings from employers like CVS Health, Meridian Health Services, Community Health Network, and Indiana University Health. Average Nurse Practitioner salaries for job postings in Kansas are 9% lower than average Nurse Practitioner salaries for job postings nationwide. The average salary ranks 30th among states in the country. There were also job openings from employers like Rural Health Education and Services, Providence Medical Center, Medicalodges, Inc., and Correct Care Solutions. Average Nurse Practitioner salaries for job postings in Kentucky are 14% lower than average Nurse Practitioner salaries for job postings nationwide. The average salary ranks 40th among states in the country. There were also job openings from employers like Correct Care Solutions, 853 – The Little Clinic – Kentucky, Catholic Health Initiatives, and Owensboro Health. Average Nurse Practitioner salaries for job postings in Louisiana are 11% lower than average Nurse Practitioner salaries for job postings nationwide. The average salary ranks 32nd among states in the country. There were also job openings from employers like Ochsner Health System, Correct Care Solutions, Matrix Medical Network, and General Health System. Average Nurse Practitioner salaries for job postings in Massachusetts are 20% higher than average Nurse Practitioner salaries for job postings nationwide. The average salary ranks 3rd among states in the country. There were also job openings from employers like MedOptions, Massachusetts General Hospital(MGH), UMass Memorial Medical Center, and Beth Israel Deaconess Medical Center. Average Nurse Practitioner salaries for job postings in Maryland are 3% higher than average Nurse Practitioner salaries for job postings nationwide. The average salary ranks 10th among states in the country. There were also job openings from employers like Wexford Health Sources, Inc., Dimensions Healthcare System, MedStar Medical Group, and Johns Hopkins University. Average Nurse Practitioner salaries for job postings in Maine are 12% lower than average Nurse Practitioner salaries for job postings nationwide. The average salary ranks 34th among states in the country. There were also job openings from employers like Southern Maine Health Care, Correct Care Solutions, Central Maine Medical Center, and Mountain Ltd.
Average Nurse Practitioner salaries for job postings in Michigan are 1% higher than average Nurse Practitioner salaries for job postings nationwide. The average salary ranks 14th among states in the country. There were also job openings from employers like University of Michigan Health System, Spectrum Health, Botsford Hospital, and Henry Ford Health System. Average Nurse Practitioner salaries for job postings in Minnesota are 13% lower than average Nurse Practitioner salaries for job postings nationwide. The average salary ranks 39th among states in the country. There were also job openings from employers like Essentia Health, CVS Health, Fairview Health Services, and Mayo Clinic. Average Nurse Practitioner salaries for job postings in Missouri are 2% lower than average Nurse Practitioner salaries for job postings nationwide. The average salary ranks 17th among states in the country. There were also job openings from employers like BJC HealthCare, Saint Louis University Hospital, Mercy, and Sunbelt Staffing. Average Nurse Practitioner salaries for job postings in Mississippi are 5% higher than average Nurse Practitioner salaries for job postings nationwide. The average salary ranks 9th among states in the country. There were also job openings from employers like Memorial Hospital at Gulfport, STG International, Matrix Medical Network, and 389-Valor Healthcare, Inc. (Concentra). Average Nurse Practitioner salaries for job postings in Montana are 17% lower than average Nurse Practitioner salaries for job postings nationwide. The average salary ranks 42nd among states in the country. There were also job openings from employers like Billings Clinic, Northeast Healthcare Recruitment, National Recruiters, and Matrix Medical Network. Average Nurse Practitioner salaries for job postings in North Carolina are 5% lower than average Nurse Practitioner salaries for job postings nationwide. The average salary ranks 25th among states in the country. There were also job openings from employers like Carolinas HealthCare System, Novant Health, CVS Health, and Duke University and Duke University Health System. Average Nurse Practitioner salaries for job postings in North Dakota are 11% lower than average Nurse Practitioner salaries for job postings nationwide. The average salary ranks 35th among states in the country. There were also job openings from employers like Sanford Health, Essentia Health, Sanford Health – North, and Integrity Locums. Average Nurse Practitioner salaries for job postings in Nebraska are 27% lower than average Nurse Practitioner salaries for job postings nationwide. The average salary ranks 49th among states in the country. There were also job openings from employers like Unlisted Company, The Nebraska Medical Center, Catholic Health Initiatives, and Northeast Healthcare Recruitment. Average Nurse Practitioner salaries for job postings in New Hampshire are 1% lower than average Nurse Practitioner salaries for job postings nationwide. The average salary ranks 18th among states in the country. There were also job openings from employers like Camp Kesem Chestnut Hill, ReadyNurse Staffing Services, Cheshire Medical Center/Dartmouth-Hitchcock Keene, and NP Now. Average Nurse Practitioner salaries for job postings in New Jersey are 8% higher than average Nurse Practitioner salaries for job postings nationwide. The average salary ranks 8th among states in the country. There were also job openings from employers like Barnabas Health, Integrity Locums, CVS Health, and Rutgers University. Average Nurse Practitioner salaries for job postings in New Mexico are 13% lower than average Nurse Practitioner salaries for job postings nationwide. The average salary ranks 41st among states in the country. There were also job openings from employers like Christus Health, NP Now, Presbyterian Healthcare Services, and Correct Care Solutions. Average Nurse Practitioner salaries for job postings in Nevada are 24% lower than average Nurse Practitioner salaries for job postings nationwide. The average salary ranks 46th among states in the country. There were also job openings from employers like UnitedHealth Group, SAINT MARY’S REGIONAL MEDICAL CENTER, North Vista Hospital, and Integrity Locums. Average Nurse Practitioner salaries for job postings in New York State are 21% higher than average Nurse Practitioner salaries for job postings nationwide. The average salary ranks 2nd among states in the country. There were also job openings from employers like Northwell Health, Integrity Locums, Execu | Search, and NYU Langone Medical Center. Average Nurse Practitioner salaries for job postings in Ohio are 4% lower than average Nurse Practitioner salaries for job postings nationwide. The average salary ranks 23rd among states in the country. There were also job openings from employers like Premier Health Partners, Mercy Health, Ohio State University Medical Center, and CVS Health. Average Nurse Practitioner salaries for job postings in Oklahoma are 8% lower than average Nurse Practitioner salaries for job postings nationwide. The average salary ranks 29th among states in the country. There were also job openings from employers like HILLCREST MEDICAL CENTER, A Member of Ascension Health, University of Oklahoma, and Mercy. Average Nurse Practitioner salaries for job postings in Oregon are 3% lower than average Nurse Practitioner salaries for job postings nationwide. The average salary ranks 20th among states in the country. There were also job openings from employers like Northeast Healthcare Recruitment, National Recruiters, Catholic Health Initiatives, and Unlisted Company. Average Nurse Practitioner salaries for job postings in Pennsylvania are 4% lower than average Nurse Practitioner salaries for job postings nationwide. The average salary ranks 24th among states in the country. There were also job openings from employers like Penn State Hershey Medical Center, PPRRiskAdjust.com, Matrix Medical Network, and St. Luke’s Hospital & Health Network. Average Nurse Practitioner salaries for job postings in Rhode Island are 9% lower than average Nurse Practitioner salaries for job postings nationwide. The average salary ranks 31st among states in the country. There were also job openings from employers like Lifespan, Coastal Medical, NEPRC, and LANDMARK MEDICAL CENTER. Average Nurse Practitioner salaries for job postings in South Carolina are 1% lower than average Nurse Practitioner salaries for job postings nationwide. The average salary ranks 19th among states in the country. There were also job openings from employers like Doctors Care/UCI Medical Affiliates, Inc., Matrix Medical Network, CVS Health, and Northeast Healthcare Recruitment. Average Nurse Practitioner salaries for job postings in South Dakota are 25% lower than average Nurse Practitioner salaries for job postings nationwide. The average salary ranks 47th among states in the country. There were also job openings from employers like Sanford Health, Regional Health, McCall & Lee, LLC, and Indian Health Service. Average Nurse Practitioner salaries for job postings in Tennessee are 7% lower than average Nurse Practitioner salaries for job postings nationwide. The average salary ranks 28th among states in the country. There were also job openings from employers like Correct Care Solutions, CVS Health, Erlanger Health Systems, and Vanderbilt University Medical Center. Average Nurse Practitioner salaries for job postings in Texas are 3% lower than average Nurse Practitioner salaries for job postings nationwide. The average salary ranks 21st among states in the country. There were also job openings from employers like LoneStar MedStaff, Encompass Home Health, Baylor Scott & White Health, and Correct Care Solutions. Average Nurse Practitioner salaries for job postings in Utah are 22% lower than average Nurse Practitioner salaries for job postings nationwide. The average salary ranks 45th among states in the country. There were also job openings from employers like FCS, AMG Senior Medical, HealthBridge, and Opportunity Healthcare. Average Nurse Practitioner salaries for job postings in Virginia are 1% higher than average Nurse Practitioner salaries for job postings nationwide. The average salary ranks 15th among states in the country. There were also job openings from employers like Carilion Clinic, CVS Health, VCU Health System, and Sentara Healthcare. Average Nurse Practitioner salaries for job postings in Vermont are 12% lower than average Nurse Practitioner salaries for job postings nationwide. The average salary ranks 36th among states in the country. There were also job openings from employers like Springfield Medical Care Systems, Inc, NEPRC, Brine Group Staffing Solutions, and NP Now. Average Nurse Practitioner salaries for job postings in Washington State are 3% higher than average Nurse Practitioner salaries for job postings nationwide. The average salary ranks 11th among states in the country. There were also job openings from employers like CHI Franciscan Health, Catholic Health Initiatives, Multicare Health System, and Northwest Hospital & Medical Center. Average Nurse Practitioner salaries for job postings in Wisconsin are 11% lower than average Nurse Practitioner salaries for job postings nationwide. The average salary ranks 37th among states in the country. There were also job openings from employers like Froedtert, Aurora HealthCare, Correct Care Solutions, and Medical College of Wisconsin. Average Nurse Practitioner salaries for job postings in West Virginia are 6% lower than average Nurse Practitioner salaries for job postings nationwide. The average salary ranks 26th among states in the country. There were also job openings from employers like Fairmont Regional Medical Center, West Virginia University Health Associates, Matrix Medical Network, and Healing Hearts Home Care. Average Nurse Practitioner salaries for job postings in Wyoming are 17% lower than average Nurse Practitioner salaries for job postings nationwide. The average salary ranks 44th among states in the country. There were also job openings from employers like Cheyenne Regional Medical Center, Opportunity Healthcare, Ivinson Memorial Hospital, and Correct Care Solutions.